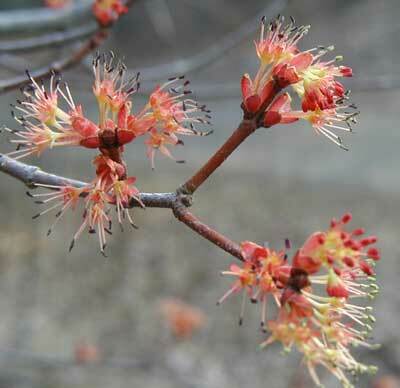 For the past week or so I have been watching the maple trees awake from their winter slumber. For a long time I never considered trees very much or even thought about how they propagate themselves. Who knew that trees flower? Of course the beautiful ornamental trees like crabapples or the fruit trees like apples and peaches flower — how else would they provide their fruits? And the regular old trees of the forest? They blossom, too, as many allergy sufferers can tell you. The tree pollen is in the air here and the earliest culprit seems to be the maples. This maple tree has been blooming for more than a week. We should have planted this beautiful star magnolia nearer to the house so we could smell the sweet blossoms through an open window. 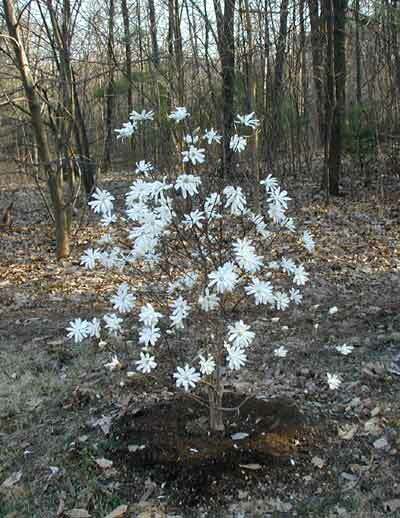 A beautiful star magnolia in full bloom. On Friday I walked around the property and finally spotted my favorite flower in bloom — the round-leaved hepatica. 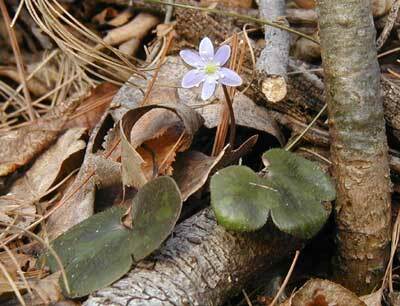 A member of the buttercup family, hepatica appears in Pennsylvanian woodlands before the trees produce their leaves. For a couple weeks I have spotted the waxy leaves that over-winter under the cover of oak leaves. After a rain on Thursday the blossoms appeared the next day. It has been very dry this winter and spring. Only four blossoms have been seen. So far, I have only seen hepatica on the upper part of a west-facing slope near the big stand of hemlock trees. Last year there were at least 11 individual plants in this area and they produced many more blossoms that what I have seen this year. 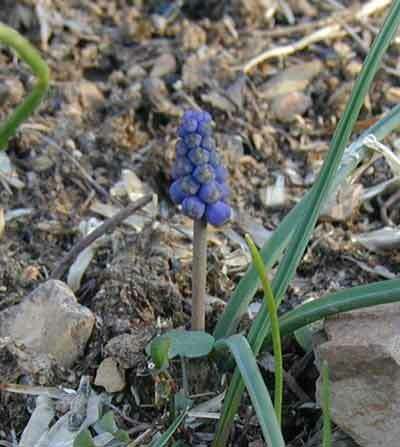 A single grape hyacinth plant returned from last year’s planting. Since there are so many squirrels and chipmunks in the area, I guess we should be glad to see any bulbs make it from one year to the next. Grape hyacinth showing off its grape-like, deep purple flowers.